For a stylish and chic look, these statement earrings from Evoke are the perfect addition to your jewellery box. Crafted from precious sterling silver and plated with yellow gold for a luxurious finish, these gorgeous drop earrings feature an intricate twist design set with shimmering peach coloured crystals for a sparkling finish. 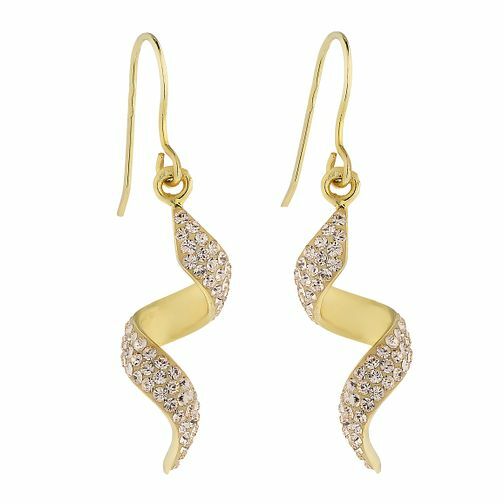 Evoke Silver & Yellow Gold Plated Crystal Set Twist Earrings is rated 3.7 out of 5 by 3. Rated 1 out of 5 by Anonymous from Faulty item I bought these earrings for my friends birthday and they we faulty! One of the earrings is almost entirely green in color, not gold! It's really bizarre that they didn't check the product before sending it out. The earrings would have been perfect if not faulty. I wish I could attach a picture. Anyway, now I have to go through the process of returning them. Rated 5 out of 5 by Anonymous from Gorgeous Really beautiful, a good size and nicely done earnings. I would definitely recommend them to anyone who is looking for something special that won't cost a fortune.